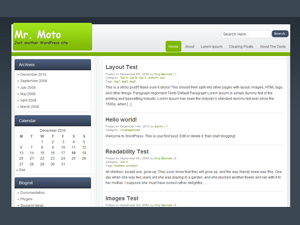 rtMoto is a free WordPress theme built as an alternative for Blogger.com’s Mr. Moto theme. rtMoto is compatible with WordPress 3.0 and onwards. Thumbnail generation may fail if you are using a cheap webhosting and your blog contains very large images. In that case, you can try increasing PHP-memory by following steps here. This theme is mainly developed by Manish Songarikar & Pradeep Sonawane from rtCamp.